Carl Holder in An Intimate Evening With Typhoid Mary. Photo by Knud Adams. BOTTOM LINE: A dying man recounts his life through a delirious, gender-and-time-bending final performance. From the sterile recesses of a hospital room, the gaunt, ethereal Martin Allen (Carl Holder) rises in his reclining bed and addresses the audience with the charm of a practiced emcee. Even as he hacks up blood, and a nurse (Molly McAdoo) rushes in to check his vitals, this fey creature continues to hold forth, welcoming his public with non sequitur jokes and old-timey show tunes. Quarantined with a mysterious—and fatal—illness, Martin is determined to tell his life story in the form of a glitzy one-man cabaret, and now invites us to witness this final act. Thus begins An Intimate Evening With Typhoid Mary, a dying man’s feverish meditation on identity, creativity, and struggle. With his death looming imminent, Martin launches into narrative, blending stylized personal memories with accounts of the infamous “Typhoid” Mary Mallon, history’s first asymptomatic carrier of the typhoid fever pathogen. The similarities between these stories quickly become evident, with the immigrant Mary’s quest to succeed as a cook paralleling Martin’s efforts to make peace with the past, own his homosexuality, and build a successful drag career. Made pariahs by their respective conditions, both figures must now fight for their dreams in the face of overwhelming physical and social obstacles. Martin’s delirious seesawing between recollection, tall-tale, and reality, and Holder’s interchangeable use of Mary’s and “Marty’s” names, continually blurs our perception, highlighting the artistry—and artifice—inherent in gender construction, storytelling, and self-identification. Holder counterbalances Martin’s surreal inner monologue with the stark veracity of his illness as a rotating medical team cleans, feeds, medicates, and monitors him throughout. Squeamish viewers, be warned: procedures such as the administration of laxatives and the forcible removal of a bowel obstruction are rendered in jarringly realistic detail. From Justin Kuritzkes’ cooly professional Doctor to Ephraim Burney’s headphoned, mop-wielding Orderly, each ensemble member toes the line between chilling clinicality and stifled empathy in their treatment of the declining Martin. One scene, in which a biohazard-suit-clad volunteer (Sofiya Cheyenne Perez) reads Martin a children’s-book version of the Typhoid Mary story, is as surprisingly tender as it is eerie. Mary’s striking design elements root us even more deeply in the show’s dark dreaminess and hyper-reality. 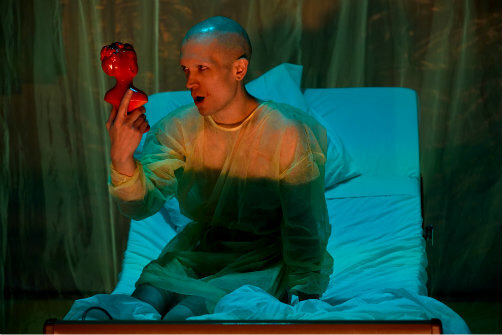 The sickly green, fiery red, and arid florescence of Oona Curley’s lighting perfectly complements set designer James Ortiz’s gauzy curtains and translucent scrims, evoking the hazy box of Martin’s mind as well as his claustrophobic medical surroundings. Likewise, Peter Mills Weiss’s soundscapes lend taut anticipation to the drone and buzz of hospital machinery as Martin’s end draws nearer. Holder’s script paints Martin’s and Mary’s stories with a fairly broad stroke; a bit more specificity might allow audiences to connect more deeply with each character. Nonetheless, this impressionistic style fits well with the show’s thematic elements, and Holder’s versatility and showmanship carry us through most of its plot gaps. Ultimately, Typhoid Mary explores the individual’s battle with time and circumstance: how do we, as artists and humans, define ourselves in light of adversity, and what do we make with the time we have left? It takes a lifetime, let alone a seventy-five minute show, to properly dissect these questions, but by distilling one man’s life into a haunting farewell performance, Glass Bandits sure makes a compelling attempt. An Intimate Evening With Typhoid Mary is written by Carl Holder and directed by Knud Adams. Set and Prop Design by James Ortiz. Lighting Design by Oona Curley. Costume Design by Andrea Hood. Sound Design by Peter Mills Weiss. The cast is Ephraim Birney, Carl Holder, Justin Kuritzkes, Molly McAdoo, and Sofiya Cheyenne Perez.